Freekeh has much more flavour than most grains. Smoky and mellow, it makes a good backdrop for seasonal greens like purple-sprouting broccoli. 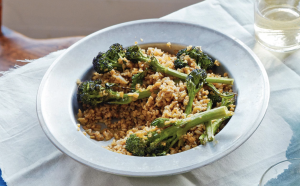 You can prepare the freekeh a day in advance then roast the broccoli just before serving. Step 2 Trim the lower woody stems off the broccoli if necessary and pare the membrane off the sides of the stems using a potato peeler. Toss the broccoli in a little olive oil and season with salt. Step 3 Place it in a roasting dish then bake in the oven for 20-25 minutes until tender. Remove and set to one side. Step 4 To prepare the freekeh, put the oil in a frying pan or large saucepan and add the shallot and garlic. Cook until soft then add the allspice and freekeh. Fry over a low to medium heat for two minutes, then pour over just enough water to cover. Simmer until tender – about 15-20 minutes – then season with salt and pepper. Step 5 Transfer to a serving dish and add the broccoli. Mix lightly and serve at room temperature.